Museums once were sanctuaries where visitors quietly contemplated artwork. Times have changed. Many modern museums now serve as gathering spots for the art-minded and (especially) the young. To this end the Berkeley Art Museum (BAM) last fall launched L@TE, a Friday evening series where the doors stay open late and the program includes DJs, wine and beer, and much gregarious socializing. BAMscape, a commissioned installation in the museum’s central atrium, supports BAM’s new activities and direction. To give the space an airier feeling and make room for the piece — a 1,550 square-foot vibrant-orange construction — BAM removed interior walls in its central atrium, Gallery 2, leaving the west windows exposed. Berkeley architect Thom Faulders, who conceived and designed BAMscape, describes the piece as “very amorphous, free form, lumpy, irregularly shaped.” Made from curved, painted wood assembled over a foam core, BAMscape reflects the sometimes competing uses envisioned for the piece. The museum wanted to create an environment where visitors can congregate and a structure on which they can lounge and relax — in deference to what BAM Director Lawrence Rinder calls a “more energetic, dynamic, and social types of programming and atmosphere” in contemporary museums. The recent economic downturn, he speculates, may be drawing people to such art happenings at BAM and other museums. 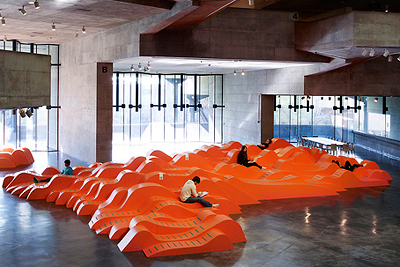 Faulders, who teaches architecture at California College of the Arts, conceived a “cross grain” for BAMscape, with soft contours in one direction “that welcome the body in any number of positions.” In the opposite direction he constructed a series of steps that invite people to gather informally. BAMscape was also designed to be durable (since people will walk on it for several years), yet inviting “both psychologically and for the body,” Faulders says. It features abundant electrical outlets to accommodate laptop users, and materials that can be recycled or reused at the end of its lifecycle. BAMscape is on view — and available for use — through Nov. 30, 2011.